Dollhouse: Epitaphs is based on the television series created by Joss Whedon for actress Eliza Dushku. What started out as a project to showcase Eliza’s acting abilities quickly became something else, when the genius of Whedon combined elements of scary science-fiction with what is already possible in the real world: and what we have is Epitaphs. The comic book is just the beginning of a series, if I’m not mistaken. Jed Whedon (brother of aforementioned Joss) and wife Marissa Tancharoen wrote two post-apocalyptic finales for Dollhouse when it was still on air. This time, they’re taking that future into the world of comics with the help of the talented Cliff Richards’ art. Epitaphs deals with what happens when a powerful technology, like mind-wiping, gets into the wrong hands. The season one finale of Dollhouse dealt with a group of Los Angeles survivors trying to find a safe place away from technology that could mind wipe them, and their eventual escape. Dollhouse: Epitaphs takes us to Day One of the apocalypse. We don’t get talking heads—characters that explain why what’s happening is happening. Instead we get dropped smack dab into the day of the apocalypse, with the three main characters of Epitaph One and the twist hero of Epitaph Two. We see a semblance of their normal lives before everything gets wrecked—and then we see them band together. What I liked about Dollhouse: Epitaphs was the little things we learn about the characters; as well as the plot-fill of how the twist hero of Epitaph Two managed to make an army of his own. But as a standalone, I don’t think this particular story works. We only get the beginning. For the rest of the story, you’ll need to watch the Epitaph One episode. 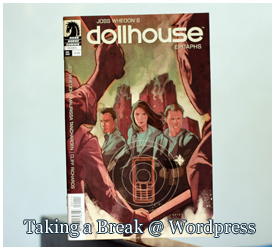 And probably grab the next issue: Dollhouse #1 when it does come out. That’s the thing about comic books, isn’t it? You never get the whole story—unless you buy the next issue. It’s a marketing genius. Except I don’t think I’ll be following the comic series when it does begin this July. Why? Well, for one thing, it took me months to find an issue of Epitaphs. Apparently, our comic book stores rarely buy issues from independent publishers. And even when they do, they only get a few to make sure they don’t lose money. Good thing for them, bad thing for us fans. But can I blame them? Not really. They’re running a business! But I sure am allowed to be disappointed that some independent titles aren’t getting released here. in the beginnning, artemis fowl was a criminal mastermind — and he was only twelve years old. three years later, nine in our time, he is fifteen years old and is not the boy he used to be. for one thing, he no longer thinks like a criminal. which should be a good thing, but when you’re reading about a young criminal mastermind, you kind of expect criminal thoughts. then again, THE ATLANTIS COMPLEX doesn’t promote artemis as a criminal mastermind anymore. “Artemis has committed his entire fortune to a project he believes will save the planet and its inhabitants, both human and fairy. Can it be true? Has goodness taken hold of the world’s greatest teenage criminal mastermind? Captain Holly Short is unconvinced, and discovers that Artemis is suffering from Atlantis Complex, a psychosis common in guilt-ridden fairies, not humans, and most likely triggered in Artemis by his dabbling in fairy magic. Symptoms include obsessive-compulsive behavior, paranoia, multiple personality disorder and, in extreme cases, embarrassing professions of love to a certain feisty LEPrecon fairy. ARTEMIS FOWL: THE ATLANTIS COMPLEX seems to be an exercise in futility. i have enjoyed the previous six books of the ARTEMIS FOWL series immensely, and i was excited to read this latest installment because of the catchy blurb. and for the first time since i met artemis fowl, i was disappointed. heck, i had to fight off sleep throughout the time i was reading the book. and that’s when i know the book had lost my interest. i feel asleep twice while reading. but why do i say it’s an exercise in futility? well, first of all there’s “the project” which the blurb describes as something that would save the world, for both humans and fairies. it reads and feels like a plot device, and for all intents and purposes, it was a plot device. to make sure that artemis and a few other characters would be at a certain place at a certain time. and then, when it does get mentioned again, it is only mentioned in passing. this is the first time i start questioning the book. “the project.” it gets described in detail, and it is mentioned that artemis has spent quite some time developing it. since they’ve mentioned that the atlantis complex was doing things to artemis’s mind, i would’ve have chalked up the simplicity of the plans as a result of artemis’s deteriorating condition. but foaly, the genius centaur character, is actually impressed with the plan. and i don’t buy it. the plan is child’s play for the old artemis. and the old foaly would never be impressed with the simplicity of the plan, because he would’ve already thought of it. don’t worry, that’s not a real spoiler. “the project” really doesn’t play a part in the main story thread of the book — which i also found problematic. once the villain is introduced, the book begins to pick up pace. and i would be lying if i said the book was not enjoyable. it was. it just wasn’t as good as the previous books. and things begin to get predictable near the end. i guess that’s the problem when you have to keep upping your a-game as you progress in your series. but having been impressed with the complexities of THE TIME PARADOX, which was the book preceding THE ATLANTIS COMPLEX, i was expecting something in the same level. or at least around that level of genius. okay, maybe genius is too strong a word. but i was definitely looking for something that doesn’t cop out in the end. THE ATLANTIS COMPLEX builds up this villain that would do anything — anything — to get what he wants. and in the end, well, the end was just disappointing. with a few pages left, i was wondering how the author would tie up everything. i wasn’t expecting a neat tie-up, but a good one. what i got was a cop-out. and i can’t really extrapolate without giving the whole plot away. and don’t get me started on the actual atlantis complex. it’s a great psychosis, actually. i just didn’t like how it was played up for its comedy. it had so much potential for tension, for suspense — but instead we get a bumbling alter-ego, and a lot of numbers mumbo-jumbo. also, this is my first ARTEMIS FOWL book with the new cover. while it does look better than the old covers, i really dislike the fact the publishers would change the look of the books midway through the series. the least they could have done was released a version with the old look as well. it’s as if they want die-hard collectors to repurchase the old books just so everything would look uniform. which i don’t plan to do. 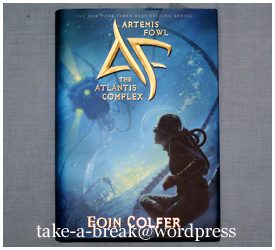 to conclude, ARTEMIS FOWL: THE ATLANTIS COMPLEX is definitely a disappointment to me.